Eliminate your clutter. Make a donation of your reusable clothes and household items. Now servicing Cincinnati, Northern Kentucky, Dayton, Columbus and Cleveland! 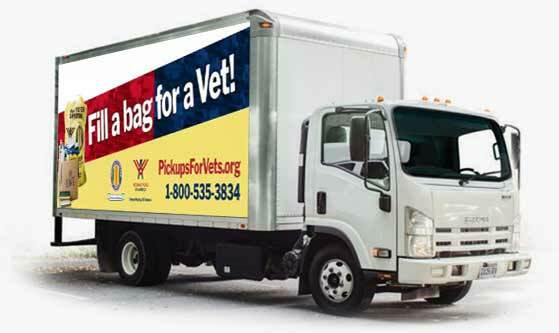 Schedule online in 3 easy steps, or call 1-800-535-3834 to schedule a pickup by phone. Put items on your porch by 7:30 A.M. on the scheduled day. Our driver will collect your donation and leave you a tax receipt. 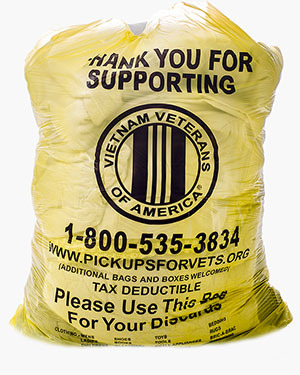 Your donations help improve lives of our nation's veterans. No ticker-tape greeted the men and women who returned from service in the Vietnam War. No hand-shakes, no thank-you's and hardly any recognition. So, those veterans turned to each other and formed Vietnam Veterans of America. Never again will one generation of veterans abandon another. True to its vow, VVA takes a keen interest in the veterans of other conflicts, both older veterans and the young veterans coming out of Iraq and Afghanistan. We assist veterans with Claims Assistance, Advocacy, Counseling, PTSD awareness, Community involvement and any issues affecting our veterans. ©2017, VIETNAM VETERANS OF AMERICA, INC. Sorry, We do not service the zip code . If you made an error entering your zip code, use the back button below to correct it. New: Click Here to ship your donation with a free label from UPS. Zip Code: Use the calendar below to select a date for your pickup. Click Here to ship your donation with a free label from UPS. ** This helps us reach the correct person should we need to contact you regarding this pickup. *** The contact information provided will only be used for communication purposes regarding this pickup. We will contact you as a reminder the day before your scheduled pickup date, or if circumstances such as bad weather prevent us from making your pickup on the selected date. You will be reminded at each method you provide. If you choose to be called, you may receive up to 3 phone calls the day before your pickup. If we haven't reached you by the third attempt, we leave a message on your answering machine or voicemail. **** When you specify text message or email you will receive a confirmation message upon scheduling the pickup. This will include a link that lets you manage and view the status of your pickup online. We are unable to identify the address you entered as a valid address. Please use the back button to make changes. You entered a valid address, but we are unable to locate it on Google Maps. To make sure our driver can find your house, use the drop down below to select a street that intersects your street. Then use the Directions box to provide directions from that street to your address. Encourage others to donate too!